Hands up all those who know who Luc Hoffmann is. Until yesterday I had no idea. He is the grandson of the founder of the Hoffmann la Roche pharmaceutical empire and is a doctor of Natural Sciences. It is his amazing interest in ornithology which brought him to my attention. 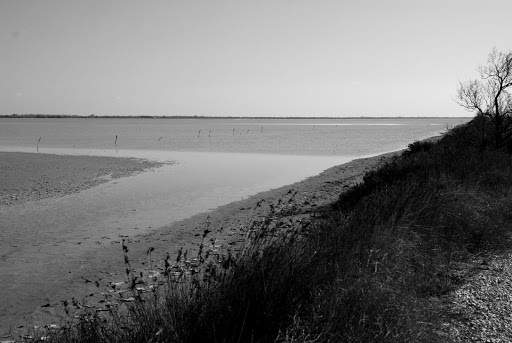 In 1948 he bought some land in the Camargue, an area in the south of France famous for birdwatching. 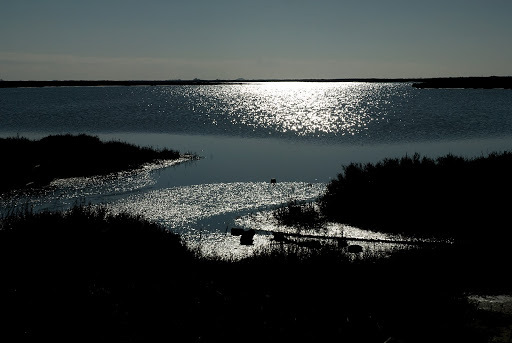 Yesterday we were on our way, at sparrow fart, to photograph the Gaschole lighthouse in the early morning light. As always we got side tracked en route. I had spotted a white stork standing atop a pylon and wanted to photograph it. Another car pulled up behind us. The driver wanted to know where La Tour Valat was. We had our map and knew we were very near it. He asked were we going there to the ornithological open day. We said we were now! That’s how I came to learn of Luc Hoffmann. The Tour Valat is a research centre where around 60 students are based. A lovely American lady explained to us how the place had been set up by Hoffmann. 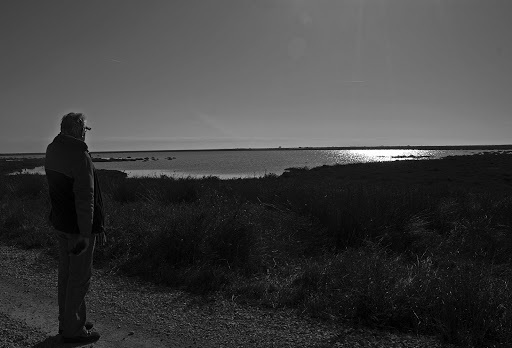 He spends about half his time there working to preserve the Camargue wetlands. His foundation also supports preservation projects in other parts of the world, notably West Africa. So I felt we were destined to “meet”. On our way home I spotted some lovely Camargue horses in a field and wanted to photograph them. I was on the outside of the field and a steep ditch divided us. Along came two ladies on horseback and invited me inside. It’s a private area but the owner, none other than Luc Hoffmann, is happy to share it with those who are sensitive to what he is trying to do. I was thrilled but as I snapped away my ears were almost blown off by the duck hunters who were busy blowing the guts out of the wetlands residents. Hoffmann’s daughter Maja founded the LUMA Foundation which support artists to create works of art in imaging. Sounds scary doesn’t it – well actually the Plague in question broke out in 1720 in the port of Marseille. The wily burgers of Cabriere D’Avignon, Provence, erected a stone wall to keep the pestilent carrying Marseillaise on the south side while they remained bug free on the north. It takes a plague to prefer the north side of the Luberon mountains to the south… A wall 25km long was erected with look out posts along its length. Wo betide (as my beloved mother would have said) anyone caught trying to go northwards. However there was the small matter of food supplies. The port of Marseille was the main spot where food imports would have landed in 1720. To get the supplies across the wall a sort of latter day “supermarket” was established. Food was handed over and one assumes coins were thrown back and ‘voila’ there was no lull in local commerce. The plague crept up as far as Avignon but apparently did not jump the wall. A lesson there for H1N1 curtailment?? Well that was the nightmare of all nightmares. End result I got pleurisy. We travelled back on the day Paris closed down. Only problem was Beauvais airport did not close down… On arrival in a relatively snow free zone there were no busses to Paris. Five hundred very excited, mostly young, people thought they were going to be stranded for life in Beauvais. Chaos ensued. The bus authorities, assisted by the Police Municipale managed to aggravate the chaos. Suffice it to say after about three hours in freezing temperatures we boarded a bus, on which a young Italian lady lost total control when she discovered her other half was still outside the bus.. Arrived in Porte Maillot to find a phantom city, no cars, no busses and no taxis. We set out to walk along the centre of the Avenue de la Grande Armeé. We arrived at our hotel at 3.00 am tired and very unhappy. Next morning I thought I was dying so we decided to head back south. A visit to my homeopath confirmed I had pleurisy. Treatment without the aid of antibiotics means that I will be unlikely to have a recurrence. However my body is wrecked from fighting the invasion. Would be really interested to see your photos of the weather in ireland at the moment, if you have a blog. I took this one in Sherkin on 5th January 2010 with a Nikon D200, s=1/350, f10. What should I call it?